Restylane improves lips, lines, and more! Many things get better over time, but not your skin. As we grow older, visible signs of aging can include lines and wrinkles around your nose and mouth, as well as thinning lips and tiny lines near your mouth. All of these areas respond well to treatment with today’s hyaluronic acid (HA) dermal fillers. The first HA filler on the market, Restylane is approved by the FDA and has proven safe and effective results for fine lines and lips for many years. At Ageless Medical, we offer several Restylane products, each with unique characteristics and benefits, so that we can meet your individual needs with just the right filler or combination of fillers. Restylane Dermal fillers like Restylane can be used to treat several common signs of aging, including marionette lines, laugh lines, nasolabial folds, and lines around the lips (who knew those are called perioral lines?). In addition to deeper lines, Restylane is FDA indicated for lip augmentation and works well to smooth fine lines. What most patients like best about HA dermal fillers is that they offer immediate results and minimal downtime. The beautiful effects of Restylane last up to 8 months before a touch-up is needed. Restylane Silk Ageless Medical is pleased to offer Restylane Silk, the first FDA-approved filler designed specifically for the treatment of lips and the little lines that surround them. Restylane Silk’s refined formulation is designed for precise lip shaping and for smoothing the lines around your mouth to create a natural look. Restylane Lyft Could your face use a lift? With Restylane’s Lyft (formerly known as Perlane-L), we can treat facial volume loss and fill wrinkles. If you’ve noticed sagging or drooping, which may be the cause of some of the lines around your face or nose, Lyft can elevate your cheeks and midface, providing just the lift that you need. This amazing filler can last up to a year or more before a touch-up is needed. Restylane Refyne You like to laugh and smile even though you don’t appreciate the lines that go along with these facial expressions. With Restylane Refyne, we can fill fine lines, marionette lines, nasolabial folds, and also lips without causing changes to your expressive face. Restylane Defyne For deep lines around the mouth and nose, Restylane Defyne provides a smoother appearance. Made with XpresHAn Technology, Defyne creates natural-looking results that will give you plenty to smile about. The unique hyaluronic acid used in Refyne and Defyne is very flexible, so it moves with your facial expressions. Both Refyne and Defyne are research proven to give you more natural results. Watch as Julie Lorenzo, ARNP, performs a Restylane injection on an Ageless Medical patient. Known in the industry and the community as an expert on all things injectable, Ageless Medical’s Erin Owoc, ARNP is one of the most experienced injectors in South Florida and serves as a trainer for doctors and other medical professionals who want to learn how to provide injections and dermal fillers. For many years, Erin has been a trainer for Allergan and Galderma, two of the companies on the forefront of today’s cosmetic medical treatments. 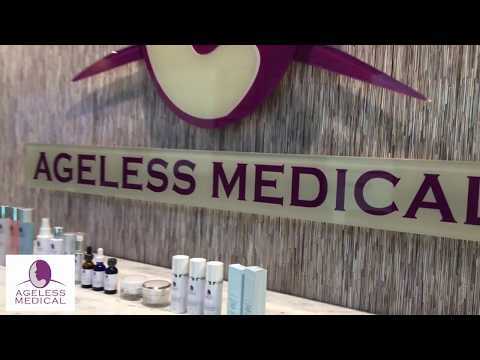 At Ageless Medical, we offer a variety of injectables, fillers, and similar products so that we can always create the ideal treatment plan for each patient’s individual needs. With the goal of providing natural-looking results, we inject with a light touch and welcome patients back for follow-up visits to review satisfaction. We treat by the area, not the unit, so you can know from the start that we will achieve the youthful face you are seeking, nothing more, nothing less. Restylane provides immediate results with just one treatment. What issues can I treat with Restylane products? Restylane products are hyaluronic acid dermal fillers that have been FDA approved and are used for lip augmentation, to plump lines around the nose and mouth, and to restore facial volume. How long will my results from Restylane last? Results from Restylane products typically last 6 months to 1 year before a touch-up is needed, depending on the product used. Restylane products are administered through a needle, so patients generally feel a prick, but there is lidocaine in dermal fillers today to minimize discomfort as much as possible. Other than possible minor bruising and swelling in the treated area, which subsides within a few days, there is no downtime from Restylane injections. Are Restylane products safe and effective for all skin types? As long as you do not have a history of severe allergic reactions and are not allergic to any of the ingredients in Restylane, the FDA-approved range of fillers is safe and effective for use.